Amelia Hundley, who started doing gymnastics when she was four years old, comes from a family full of gymnasts. Her mother, Sharon, was a gymnast when she was in college. Two of her brothers did gymnastics when they were younger but have moved on to other sports. Hundley’s family owns a dance studio in Hamilton, Ohio, her hometown. She used to dance regularly at the studio before focusing on gymnastics. Hundley, 13, qualified for the 2009 Junior Olympic National Championships after winning at the state and regional levels. In 2010 she qualified for the Visa Championships and the Nastia Liukin Supergirl Cup. At the inaugural Nastia Liukin Supergirl Cup, she posted the third highest score for the floor exercise. In 2011, she qualified for her second Nastia Liukin Supergirl Cup at the CGA Parents Club Coaches Spectacular by finishing second in the all-around in her classification. Fellow teammate Kayla Williams also advanced to the Nastia Liukin Supergirl Cup from that event. Hundley and Williams train at the Cincinnati Gymnastics Academy, where Hundley trains five hours a day. 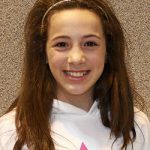 At the 2011 IGI Chicago-Style Meet Hundley took top honors for the balance beam, was second in the all-around and tied for second on the floor. Hundley attributes her success to the support of her parents and coaches. She is home-schooled and is in seventh grade. Hundley has not yet started looking at colleges, but is would like to make the national team and earn a collegiate gymnastics scholarship.